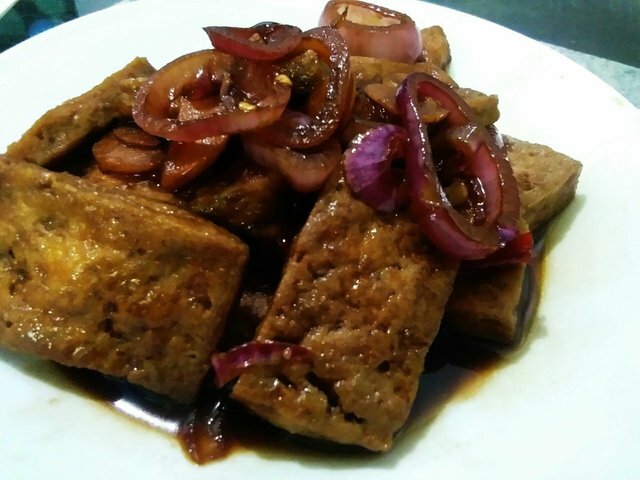 After my Tokwang sisig post, I would like to share my new delicious and tasty dish - Tofu Steak. First, slice the tofu in thin pieces and fry. Second, saute the garlic, pour out soy sauce, calamansi extract, and water. Simmer atleast 5 minutes. Third, put the fried tofu, add some salt and sugar, simmer for atleast 3-5 mins to cook. Lastly, put the circle-chopped onion and chili, mix a little bit and simmer for atleast 5 mins. Very healthy! A great substitute for red meat to gain protein in our body! Keep sharing! Correct 😍😍😍 and there is no MSG. Nice post..thank you for sharing!